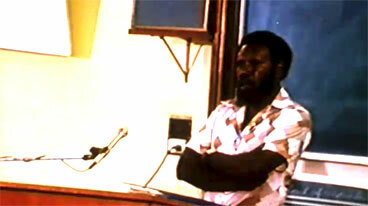 Video clip synopsis – Aboriginal Elder and teacher Douglas Bon remembers Eddie Mabo and the landmark land rights case he fought. Broadband MP4 indimabo_bb.mp4 (9.2MB), suitable for iPods and computer downloads. On a map of Australia locate the Torres Strait and Murray Island. Discuss and define Land Rights. Do you think that many Australians understand what Native Title is? Why do you think many people were worried by Native Title? Was this concern justified? Explain why you think it was or wasn’t. Discuss and find out who Eddie Mabo is and why he is important to Australian history generally and more specifically the history of indigenous land rights in Australia. What relation is Douglas Bon to Eddie Mabo? How does he describe this relationship? Why does Douglas say it is important to retain and maintain the land? Research the life of Eddie Mabo and create a poster display. Make sure you research his work on land rights and his personal life. Research and discuss the Mabo case. Imagine you are a newspaper journalist attending the court case that is shown in the clip. Write a short editorial, commenting on the decision, its importance and the impact you think it will have on Australia.